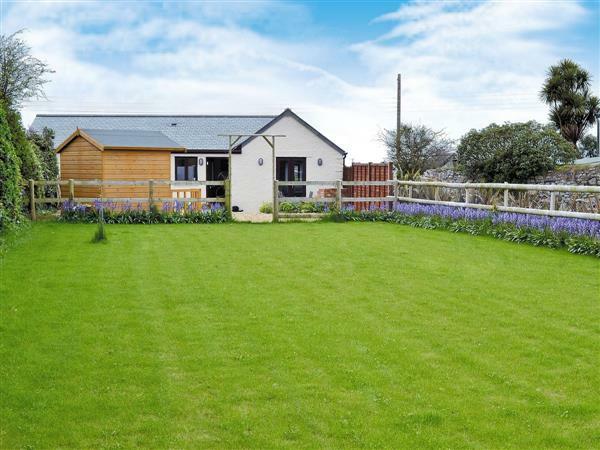 Bluebell Barn in Rosudgeon, near Penzance sleeps 4 people. Bluebell Barn is a single storey barn conversion, lovingly renovated by its owners, and features a hot tub and summerhouse in the garden. Situated between two beaches, it is ideal for exploring Cornwall’s coast. Located in the tiny hamlet of Rosudgeon and overlooking fields to the rear, full of bluebells (in season). Enjoy water sports, bathing, cafés and a local pub. Marazion with craft shops and tea rooms is a short drive. Visit St Michael’s Mount reached on foot at low tide and small boat at high tide. Take a day trip from Penzance to the beautiful Isles of Scilly by helicopter or ferry. Newlyn, Mousehole, Land’s End and Sennen all within easy reach. Shop, pub and restaurant ¼ mile. All on ground floor: Living/dining room/kitchen with tiled floors. 2 bedrooms: 1 double, 1 bunk. Shower room and toilet. Elec underfloor central heating, electric, bed linen and towels included. Travel cot and high-chair on request. DVD. Electric cooker. Microwave. Washer/dryer. Dish washer. Fridge/Freezer. Wi-Fi. Enclosed garden, patio and furniture. Summerhouse. Barbeque. Parking (2 cars). Cycle store. Hot tub. Welcome pack. No smoking. Easy walking access. Holidays at Bluebell Barn run from Saturday to Saturday. For a better idea of where Bluebell Barn is, you can see Bluebell Barn on the map below. Bluebell Barn is in Cornwall; should you be on the lookout for a special offer, you can find all the special offers in Cornwall. It's always worth checking to see what is on offer at the moment. Do you want to holiday near Bluebell Barn (27491), you can see other cottages within 25 miles of Bluebell Barn; have a look to find your perfect holiday location.